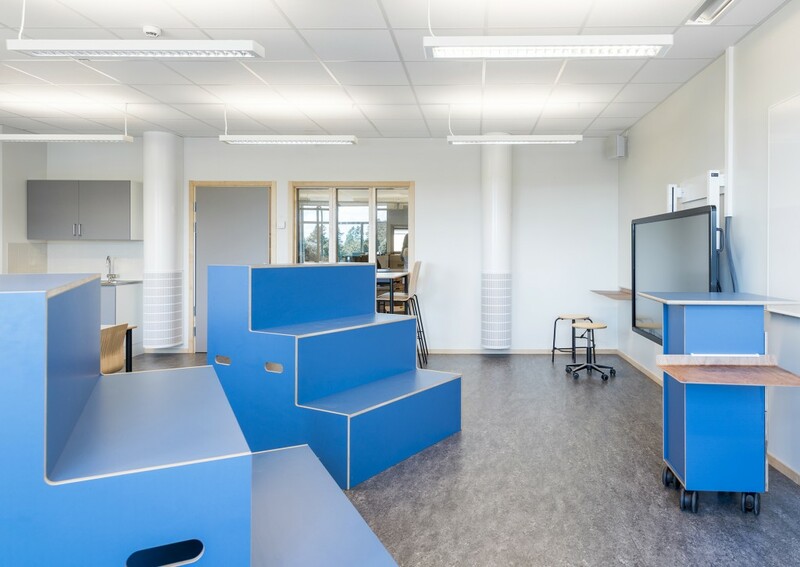 Landamäreskolan has opted to use screening-off solutions and created rooms within rooms with the aid of both high-backed sofas and innovative in-situ constructions. 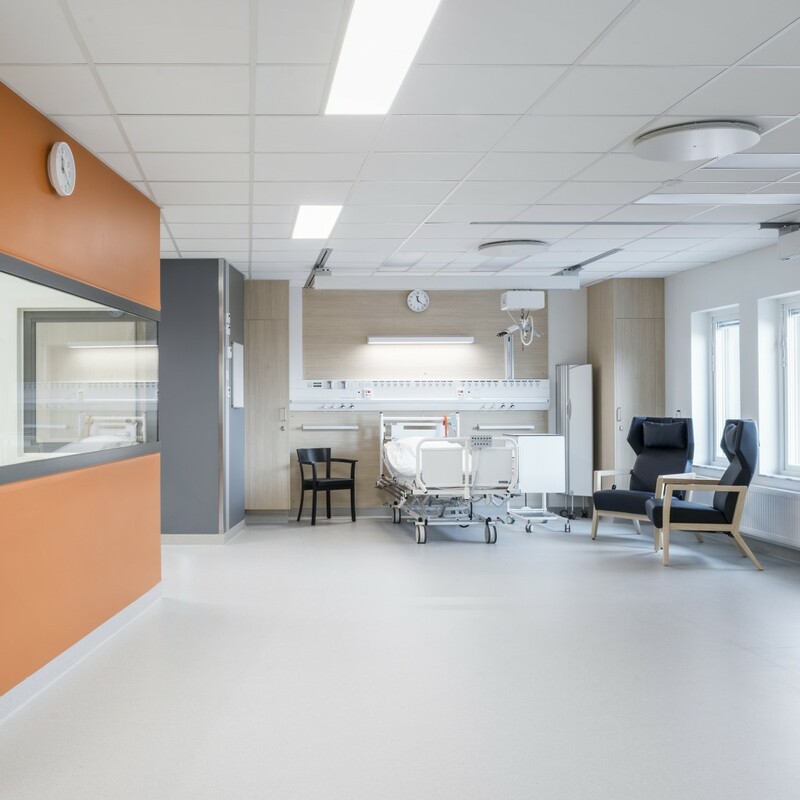 Light material choices for walls, flooring and furniture serve as a base and are enlivened by means of accent shades. The atriums boast generous ceiling heights and a wonderful sense of space. 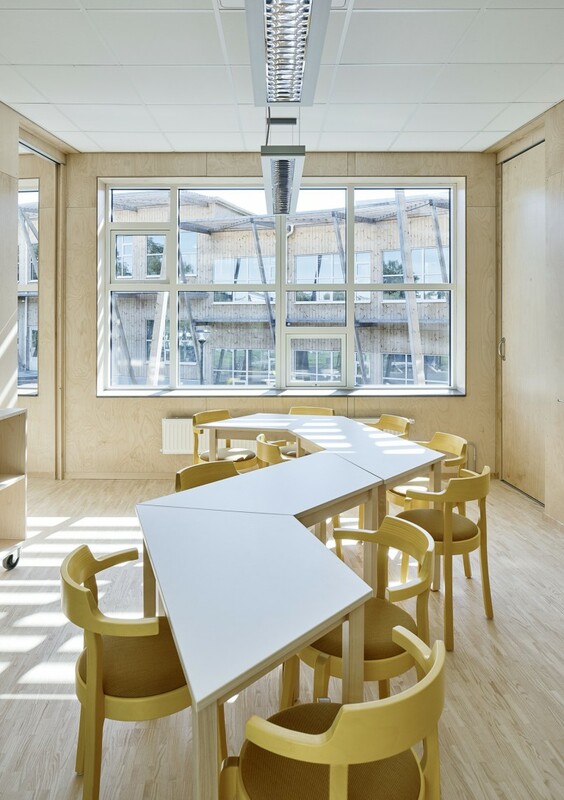 Landamäreskolan is challenging the traditional quadrangular format of school classrooms and corridors. Student visibility is paramount and the right conditions are being created for lifelong learning. Architect’s office Wahlström & Steijner has created an unusual and attractive building at Landamäreskolan in Biskopsgården, Gothenburg. 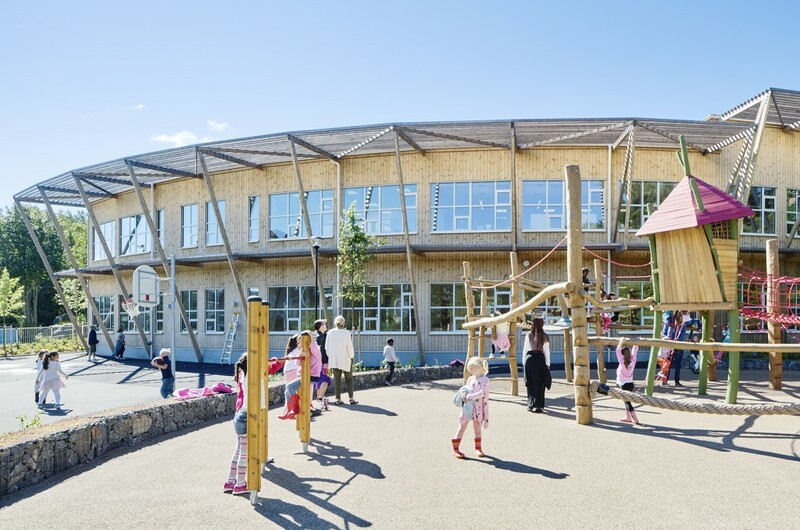 The S-shaped buillding is clad in wood and includes all departments of a school: Sports hall, dining hall, school kitchens, administration and library as well as teaching rooms for up to 400 students from preschool classes up to year 3, including special school provision. 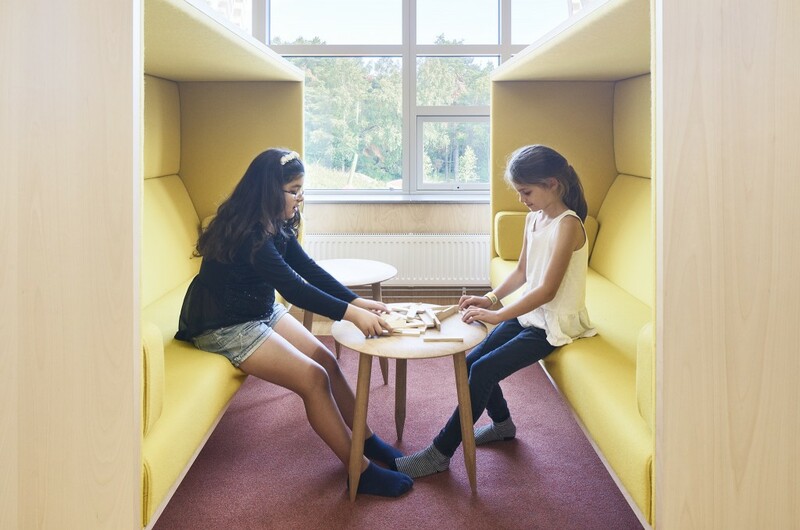 Input interior delivered the interior furnishings and implemented the architect’s and the school’s collective vision. 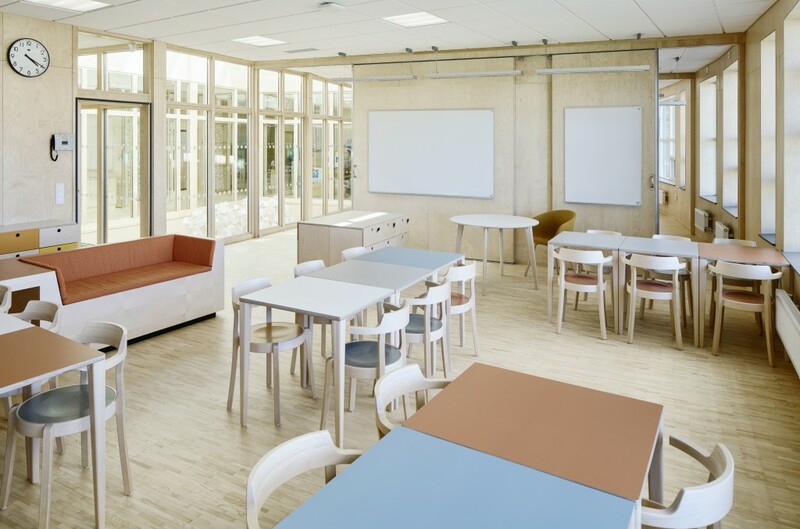 In order to promote interaction with the students on a close, individual level, the traditional classroom format has been challenged and replaced with open-plan rooms that allow the creation of small rooms within rooms, all with the aim of creating proximity and breadth of view. 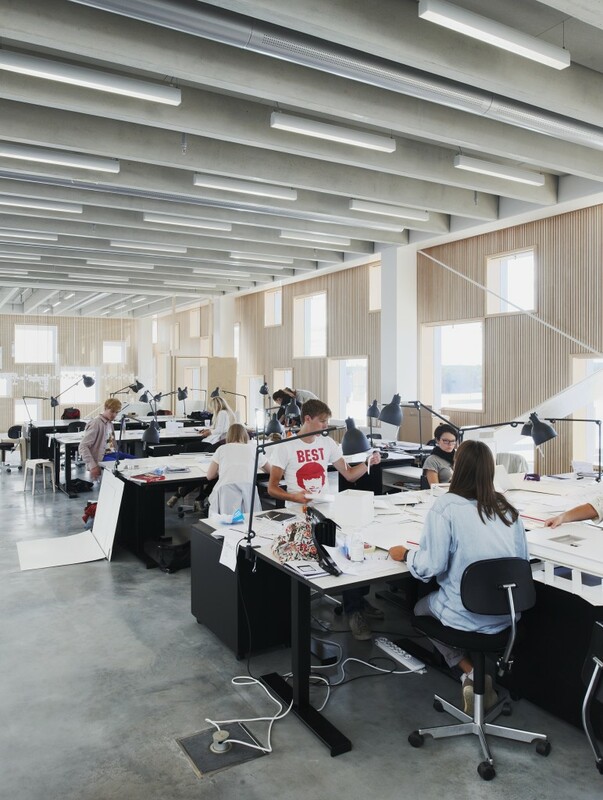 In order to screen off the teaching areas from one another and create quiet environments, innovative and multifunctional in-situ constructions have been developed. Tiered stage elements with built-in and combined storage, seating and sofas have been specially designed to meet the needs of both students and educators. 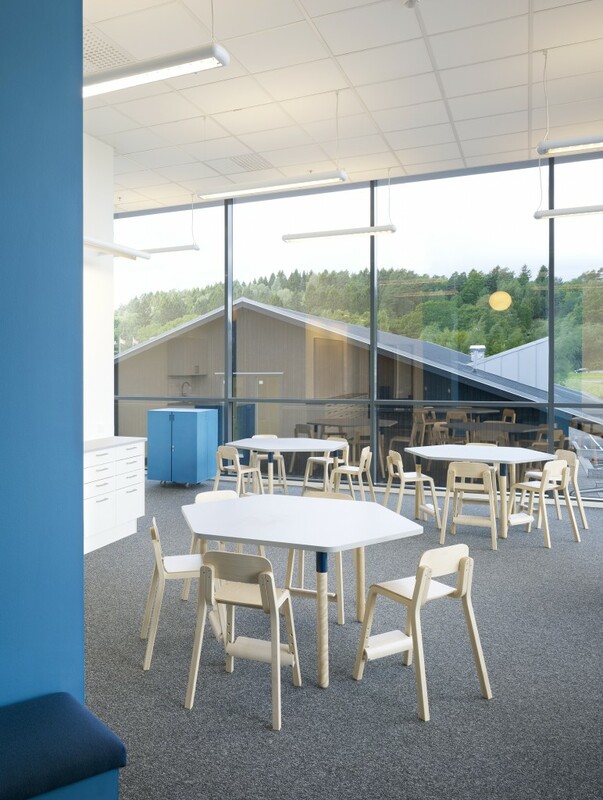 The feel of the timber façade runs as a consistent theme throughout the premises, with most walls being clad in birch plywood and the flooring being industrial parquet. 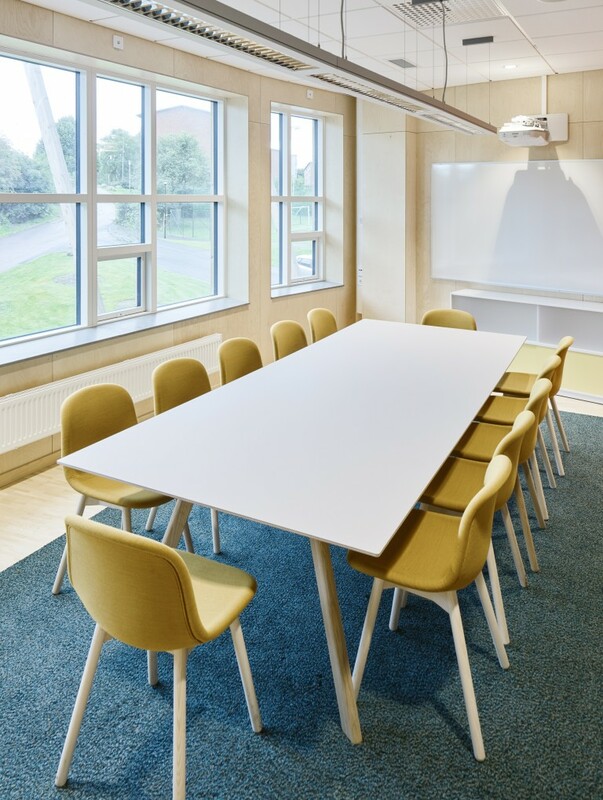 Generous ceiling heights and a wonderful sense of space are prominent features, not least where two-storey atriums extend upward, providing large, practical assembly areas at ground level. 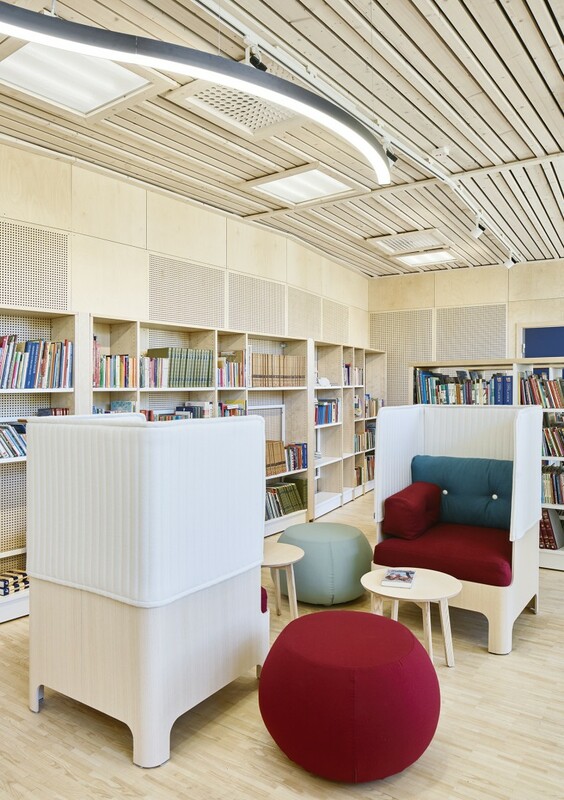 Plentiful admission of light is matched by a blonde colour scheme that makes for a calm and harmonious environment. 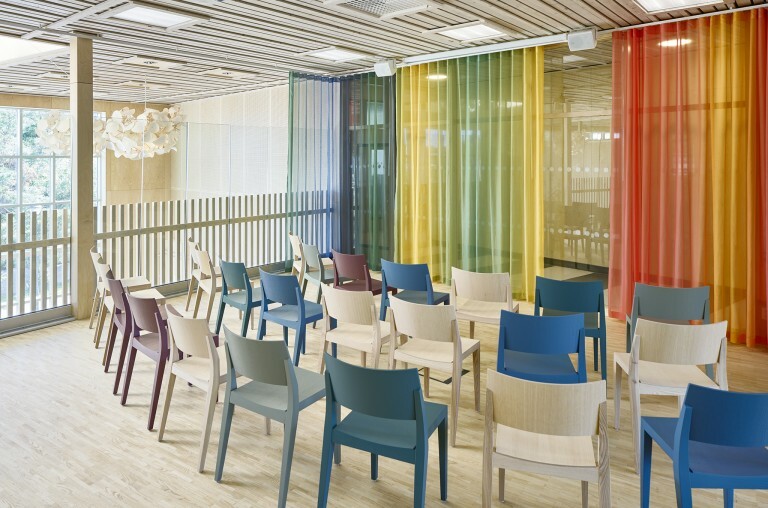 Light material choices for walls, flooring and furniture serve as a base and are enlivened by means of loose furnishings and textiles in colourful accent shades. 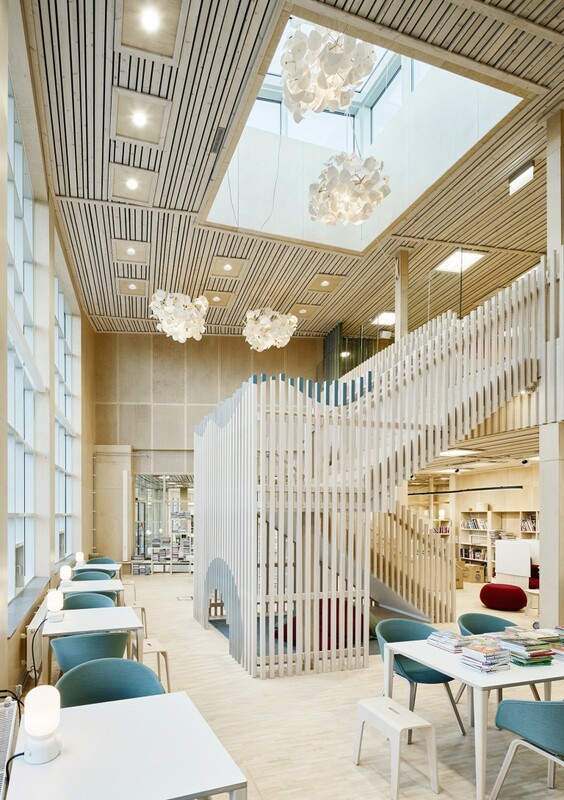 Stairs play a central role at Landamäreskolan: both indoors and out in the playground where two sets of stairs, similar to an amphitheatre, form a natural meeting place that works equally well for teaching, assemblies and games.